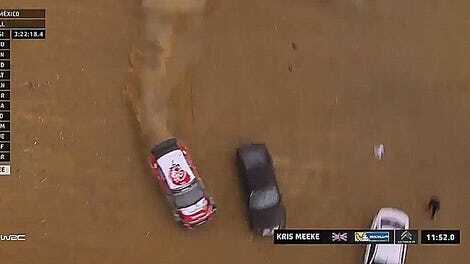 Rally Mexico had one of the most incredible ends to a rally ever, with Citroën World Rally Championship driver Kris Meeke winning the rally despite flying off the road for a detour through a spectator parking lot. Now Citröen has remixed the video to offer several funny explanations for that detour. Look, we can see that Meeke and codriver Paul Nagle are not in their rally car for these intros. We’re on to your tricks, Citroën! But anyone who’s ever had their mom call when they’re supposed to be giving directions or doing some other important task can certainly empathize with Nagle here. I’m pretty sure my mom would get even worse to deal with on that call if I yelled “Jesus Christ, Kris!” over the phone before crashing through some brush. Fortunately, these guys aren’t that easy to distract when they’re out on a rally stage. 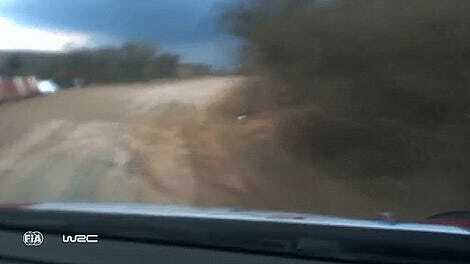 While bees are evil, these drivers rarely let even friggin’ huge pterodactyl-bees run them off track.